Research team: Emelyanov Nikolay, Zabaev Ivan, Oreshina Daria, Prutskova Elena, Melkumyan Elena, Nadezhdina Evgenyia, Belianin Alexis, Batanova Polina, Markin Kirill, Krihtova Tatiana, Alexin Cyrill, Kozmina Yana, Lokteva Yana. On Saturday before Easter – the Holy Saturday – the Orthodox churches are overcrowded and experience such an influx of people, that doesn’t happen on any other day of the year. On this day, many Orthodox believers go to church for the blessing of Easter cakes and eggs. To do this, people are willing to stand in queues for hours, even in bad weather, experiencing a variety of inconveniences. We can therefore assume that this event has an important place in the life of an Orthodox believer. The main goal of our research is to identify social types of people who come to church on the eve of Easter for the blessing of Easter cakes and eggs. Who are these people? Why do so many come for the blessing of cakes, but do not participate in church services, do not confess and receive Holy Communion? What Easter means to them? What place does this holiday take among other holidays? This is only a partial list of questions which our research is to answer. 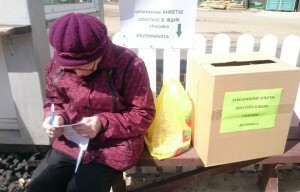 On the 30th of April 2016, on Holy Saturday, the “Sociology of Religion” Research Laboratory conducted an opinion poll of people who came to the blessing of Easter cakes and eggs in the churches of the Eastern Vicariate of Moscow. The survey covers 31 temple of the Eastern Vicariate. In total, more than 60 thousand people came to these temples on the day of Holy Saturday in 2016. More than 250 volunteers were handing out questionnaires to those who stood in the queue for the blessing of Easter cakes. The total survey sample size was 13 170 people. Melkumyan Elena. 2018. 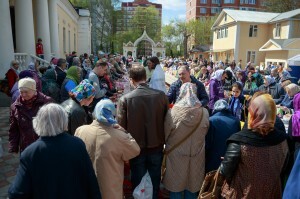 "Annual cycles of the Orthodox believers participating in the blessing of Easter food." Monitoring of Public Opinion: Economic and Social Changes, 2, 261-273. Prutskova Elena. 2018. "Easter cakes and/or Eucharist: typology of Orthodox Christians participating in the blessing of Easter food." Monitoring of Public Opinion: Economic and Social Changes, 2, 243-260. Prutskova Elena. 2017. "Easter cakes and / or Eucharist: Factors of choosing the ways to prepare for Easter among Orthodox Christian believers." Religion and History: Papers of the V International Scientific Conference, April 20-22, 2017, 253-258, Minsk, Republic of Belarus: Ed. S.I. Shatravsky. Minsk: BSU Publishing Center. Bishop Panteleimon (Shatov). 2017. "How to help people who comes on Holy Saturday to become parishioners." Shepherd, Workshop, 24.02.2017. Melkumyan Elena. 2017. "Social portraits of Orthodox believers (based on the survey «Holy Saturday: An opinion poll in the temples of the Eastern Vicariate of Moscow»)." 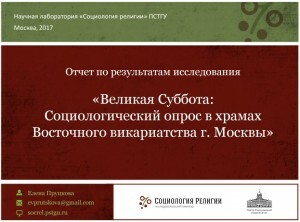 Religion and History: Papers of the V International Scientific Conference, April 20-22, 2017, 259-264, Minsk, Republic of Belarus: Ed. S.I. Shatravsky. Minsk: BSU Publishing Center. 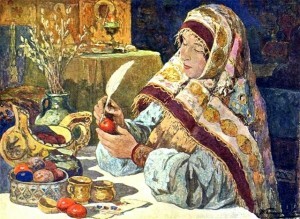 Nadezhdina Evgenyia. 2016. "Project "The Holy Saturday" (in russian)." PSTBI: News.